"One Of The Living" is a single from the soundtrack album "Mad Max Beyond Thunderdome". This song was written by Holly Knight and produced by Mike Chapman. 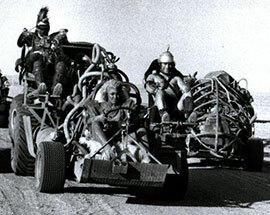 The song became the intro during the opening credits of the movie. 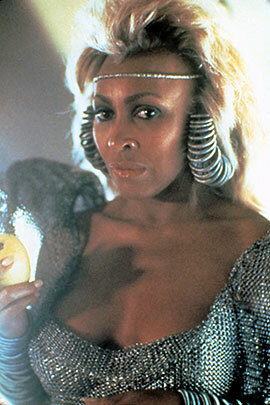 Tina starred in the movie as Aunty Entity, The Queen of Bartertown. Tina has always been a Queen. 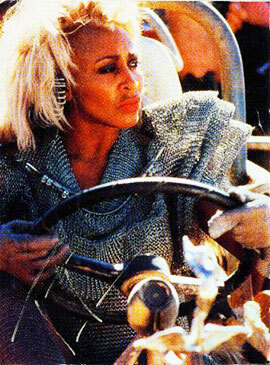 Tina was on tour in Europe in 1985 when Roger heard that Tina had to record another song for the movie. 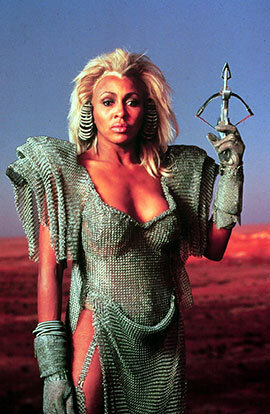 Of course "We Don’t Need Another Hero" was already there and had been released and became a huge hit all over the world. Roger contacted Holly Knight to write a new song which was in line with the movie and Tina’s wishes. Here’s the story about Holly Knight, Roger, Tina and the making of "One Of The Living". "Even after "Better Be Good To Me" had already been a hit, Tina and I had never met or talked. Roger Davies, her manager called me up one day and told me that Tina had just finished doing a movie in Australia. 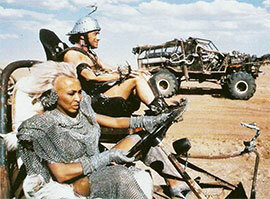 It was the follow up to the cult classic "Mad Max," and she needed a tune to sing in the movie. So I read the script and wrote "One Of The Living", a post apocalyptic metal cruncher. Roger sent it to Tina who was touring in Europe and she loved it. There was a deadline for the release of the movie that had to be met, so we decided to cut the tune before she got back to LA, and all she would have to do is walk in and sing it. My one problem with this plan was figuring out what key Tina would want to sing the tune in. (This can make or break a vocal performance, so getting it right was very important). Roger suggested I overnight her a cassette with a few versions in different keys, but I wasn’t confident that that would bring a reliable or accurate result – what if her cassette machine was running at a different speed than mine because of the different electrical currents between the two continents, or the batteries ran the machine at a faster or slower speed than mine? So Roger said, "Okay I’m flying to London tomorrow to see her and you’re going to have to come with me." That’s how I finally met Tina. She showed up at Heathrow Airport with her road manager in a limo, which I thought was unusually nice of her. We figured out the right key the next day in all of five minutes, and Tina invited me to accompany her on her tour for the next week through London, Paris and Switzerland, before I had to head back home to the studio. We stayed in some gorgeous places, ate in some amazing restaurants, went to Azzedine Alia’s studio, (the couture designer) in Paris, I saw her perform night after night from the side of the stage. I never thought being a songwriter would include such awesome "perks". But the best part was just getting to know Tina on an intimate level like this. "One Of The Living" is one of my favourites that I wrote, and has to go in my top ten list." Tina performed "One Of The Living" in a few tv/award shows like Countdown and The Canadian Juno Awards. 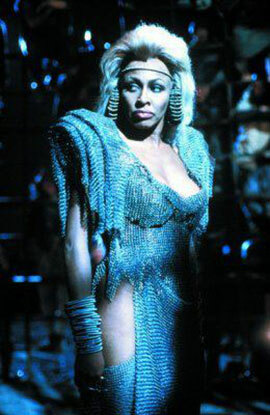 She also included the song in the setlist during the Private Dancer Tour in 1985. 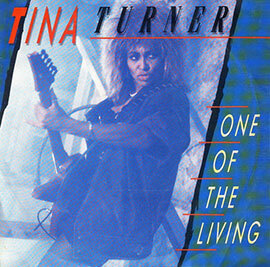 Tina shot an official video for "One Of The Living" as well. 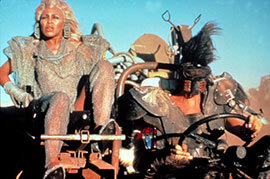 It premiered at the MTV Awards in 1985. 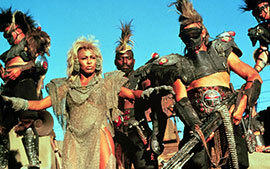 We see Tina walking around with a guitar interspersed with scenes from the "Mad Max" movie. 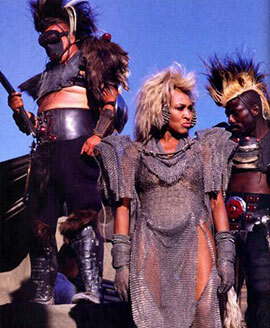 Tina won a Grammy for the song in 1986 for Best Female Rock Vocal Performance. In the song Tina (Aunt Entity) is singing about surviving. Sometimes you have to fight and kill, but it is better to stick together. The single was released in different formats and versions. 7" single and 12" single. 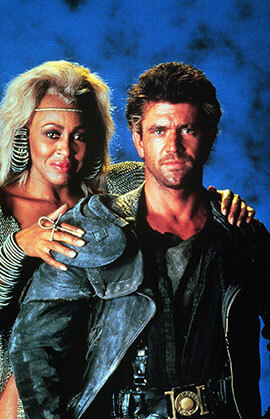 The song was included on the soundtrack album of "Mad Max Beyond Thunderdome" and much later on "The Platinum Collection". That was the first time the song made it to an album from Tina herself. 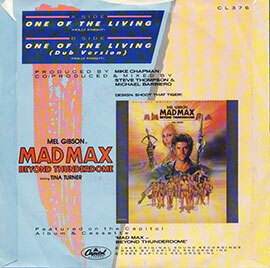 The B-side is "One Of The Living" (7" Dub). There are also a few Remixes of the song. Here’s a list of them. Album Version – 5.59 min. 7" Remix – 4.10 min. 7" Dub Version - 4.45 min. 12" Special Club Mix - 7.35 min. 12" Dub - 4.56 min. 12" Instrumental - 5.58 min. "One of the living" (7" Dub) - 4.56 min.